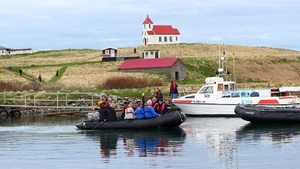 During this fascinating Iceland and Greenland cruise trip you will discover the mysterious land of the world’s biggest island. This is grand tour of Greenland: the beautiful and fertile deep south with its fascinating Viking history; a traditional Inuit society with a modern capital Nuuk; Ilulissat, the town of icebergs and its UNESCO World Heritage site, the Ilulissat Ice Fjord. 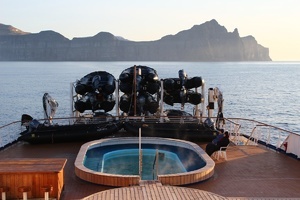 All and many other stops are part of an unforgettable journey aboard the Ocean Diamond. Individual departure or book our comfortable Air&Ground Package. Flying in from overseas or elsewhere in Greenland, you arrive at the 120-mile-long Kangerlussuaq Fjord and city of the same name. The ship will depart Kangerlussuaq harbor at 8 p.m. Aboard the MS Ocean Diamond, our experienced expedition team will hold interesting presentations to prepare you for your cruise along the Greenland coast. In the morning we visit Eqip Glacier and with a little luck will witness icebergs calving into the fjord. The afternoon is spent in Ummannaq, one of the most beautiful towns in Greenland. Located on a small island about 300 miles north of the Arctic Circle, this tiny, picturesque village is at the foot of a heart-shaped mountain. In the morning the Ocean Diamond arrives at Ilulissat. The name means “iceberg” in Greenlandic and the town definitely lives up to its name – located at the mouth of the Ilulissat Ice Fjord, which is filled with enormous icebergs. The fjord has been a UNESCO World Heritage Site since 2004. 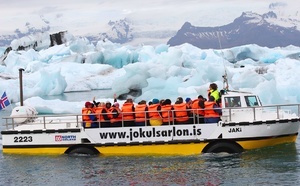 Enjoy the thunderous spectacle when icebergs break off from Sermeq Kujalleq glacier and plunge into the fjord. Sermeq Kujalleq is one of the most productive glaciers in the northern hemisphere and calves over 35 cubic kilometers of ice every year. The Greenland Sea is home to numerous seals, walruses and whales. Keep your eyes open as we sail along the coast. In the evening we will arrive in Narsarsuaq, where our ship stays in the harbor over night. Very close to the town lies the small settlement of Qassiarsuk, founded by the legendary Viking rebel and leader Erik the Red. He named this area "green land" because the landscape around Qassiarsuk is characterized by inviting fjords and green, fertile valleys. During this stop you have the opportunity to learn more about the lives of the early Norse settlers and visit the reconstructions of a Viking longhouse and small turf church. If conditions allow, we will attempt to enter the 70-mile-long Prins Christian Sound which connects the Labrador and Irminger Seas. In this narrow, often ice-choked channel, we come so close to icebergs that you can almost reach out and touch them. Greenland’s massive inland icecap pushes the glaciers toward the sea, where large chunks break off and become icebergs. Today we sail across the Denmark Strait towards Iceland. While we’re en route you can attend fascinating presentations by our expedition team members to prepare you for our visit to Iceland. 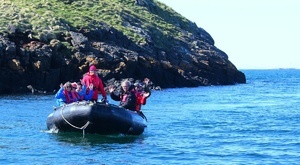 Or just relax and watch whales, dolphins and seabirds from the deck or your cabin. In the morning we return to the port of Reykjavik. After breakfast it’s time to bid farewell to the Ocean Diamond. Extend your stay in Iceland and book one of our post-cruise programs or explore Reykjavik and the surrounding area on your own. Reykjavik, which is both the economical and cultural hub of Iceland, boasts a variety of museums and shops. Scattered around the city are fascinating natural wonders like glaciers, waterfalls and geysers. Individual departure or book our comfortable Air&Ground Package.